Show methods of doing immediate and important exhibitions of art works and how to reach and involve the audience, as well as how to create a relevant live debate by Internet circulation of the outcome. The course will thus also question the interaction of art in society and the role of the artist. matters taking place next to them and those relevant in a global perspective. platform for exhibiting and debate the same day. have impact in the society?”. school to meet and exchange with others. • By completed course, students will receive a diploma. 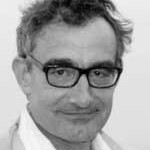 Thierry Geoffroy /COLONEL is the main teacher and leader of the workshop. During the course he will invite guests who would teach about specific expertise- or experiences areas that might be useful when working with ULTRACONTEMPORARY and EMERGENCY ART. – art exhibited in the now. To work in an ULTRACONTEMPORARY way is to be in time.